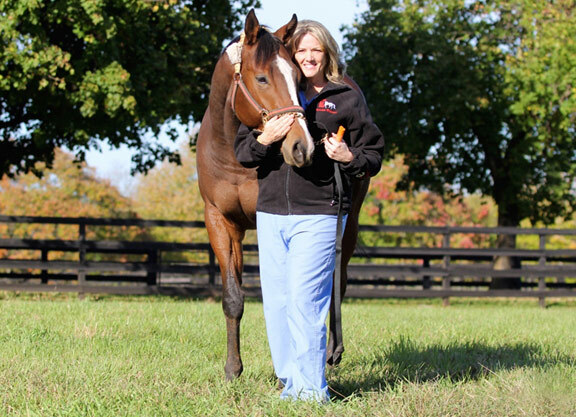 At the start of her career, Dr. Patty Hogan, who is now one of the leading equine orthopedic surgeons in the country, was often confused for a nurse or secretary. Some clients who knew her as Pat Hogan even assumed that she was a male vet until they came to pick up their horse because a female orthopedic surgeon was basically unheard of in the racing industry in the early 2000s. Pletcher, now a seven-time Eclipse winner, is one of Hogan’s longest-standing clients. She also has done work for Jimmy Jerkens, Rick Violette, Linda Rice and Mike Hushion, as well as many top trainers and owners in the harness racing industry. Creating and building those relationships did not come easy for Hogan, however. The lifelong New Jersey resident had her work cut out for her when she started her journey into veterinary medicine and broke down a lot of barriers to get where she is today. Hogan literally did just that, marching into the University of Pennsylvania Vet School’s New Bolton Center where she took a job cleaning stalls and the rest, as they say, is history. Just three months into that job, Hogan met a person who would change her life, Dr. Tom Divers. Divers gave the eager horse lover a job as a technician working on a project for bovine leukemia virus. That job, and a residency change to Pennsylvania, got Hogan into Penn the following year. Upon completing her degree at Penn, Hogan did a surgery residency at Texas A&M, where she got a big reality check. Though the residency was tough in many ways, it helped shape Hogan into the vet she is today and prepare her for the challenges she would later face on the job. Hogan returned home to the Garden State to begin her career working for Dr. Scott Palmer at the New Jersey Equine Clinic. With the help of Hunt, who referred Pletcher her way, Hogan slowly, but steadily began to build up a reputation and client base. 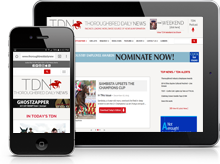 However in 2004, about seven years after joining Palmer’s clinic, a then unknown 2-year-old Thoroughbred, who came in for an emergency eye removal after a starting gate accident, would take Hogan’s career to a new level. That rambunctious colt, who was still unraced at the time, was GI Kentucky Derby and GI Preakness S. winner Smarty Jones (Elusive Quality). Not only did Hogan not remove the eye, she did not perform surgery at all. The Cream Ridge resident treated the chestnut with steroid injections, kept his face wrapped and checked on him diligently. He made a full recovery and his eyesight was completely unaffected. Hogan’s client list began to grow and grow and in 2007, after spending a year helping to plan, build and launch the Ruffian Clinic in New York, she started her own clinic at New Jersey’s Fair Winds Farm, a Standardbred breeding operation across the street from her house. Hogan’s practice is about 50% Thoroughbreds and 50% Standardbreds, which gives her the opportunity to see just about every type of orthopedic injury. With 17 racetracks, both Standardbred and Thoroughbred, within a two-hour drive of the clinic, Hogan’s clients come from all over the Midlantic area and all walks of racetrack life, from claimers to champions. In addition to champion Smarty Jones, she has worked on Eclipse winner La Verdad (Yes It’s True); GISW Take Charge Indy (A.P. Indy); MGISWs Palace (City Zip) and Sweet Reason (Street Sense); Hambletonian winner Trixton; and top Standardbred Always B Miki, who recently shattered the world record for fastest mile ever by a pacer. Hogan’s care doesn’t just stop when the horse leaves her clinic. She continues to follow each of her patients throughout their careers. Hogan is also deeply involved with aftercare, offering free surgeries to several Thoroughbred and Standardbred organizations dedicated to giving horses a life after racing.